Pizza Monday, Tuesday and Wednesday 2 to 6 pm, we will have slices out for lunch on most days. You can take and bake or we will bake it for you. Let’s make Cornucopia fun again! 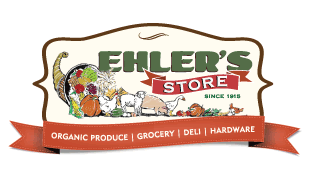 Ehlers Store is your local source for groceries of all kinds. Some unusual things like Ahi tuna. A small selection of Asian food, including Edamame. Bread from the Daily bread is delivered on Wednesday and Saturday. Wild King and Sockeye salmon. Amish chicken and of course the best hamburger ground here at Ehlers. In 1913 Herman Ehlers moved to the small South Shore community of Cornucopia, Wisconsin. He was working as a bookkeeper for the Flieth-Thompson Lumber Company in 1915 when a series of fires swept across the lakefront destroying the three sawmills in the area. 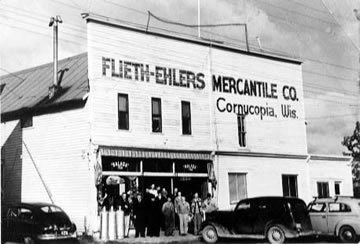 Finding himself out of work, Herman and one of his former employers founded the Flieth-Ehlers Mercantile Company, know today as Historic Ehlers Store. Herman settled in Cornucopia and married Esther Johnson, a local schoolteacher. The Ehlers raised 8 children in Cornucopia. 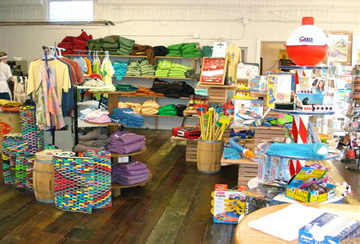 Their son Herald took over the family business from his father and ran the store until 2006. 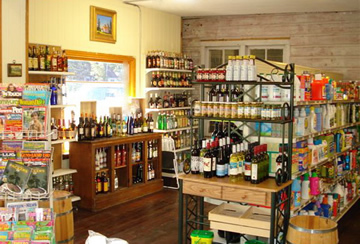 When the Ehlers Family made the decision sell Ehlers Store, it was important to them that they find buyers who were interested in continuing the tradition of the small town general store that had served their community for generations. 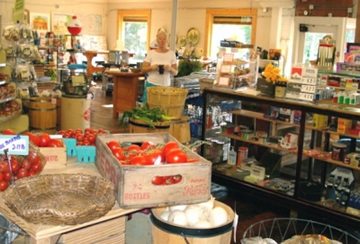 In 2005 Jayne Norton and Max Taubert came to Cornucopia with hope of buying a house in the peaceful lakeshore village but after learning that the store was for sale, their plans changed slightly. 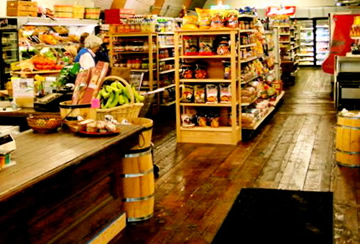 They took ownership of the Ehlers Store in 2006 and while they have made some improvements to the building and are now offering a wider selection of groceries, including organic produce and a larger hardware selection, they are dedicated to maintaining the grand tradition of the small town general store.